Your home gym is only as good as its equipment. The better your workout gear, the better workouts you’ll have, the more gains you’ll see long-term. It’s that simple. So what is the defining piece of a home gym? Easy – a Power Tower. 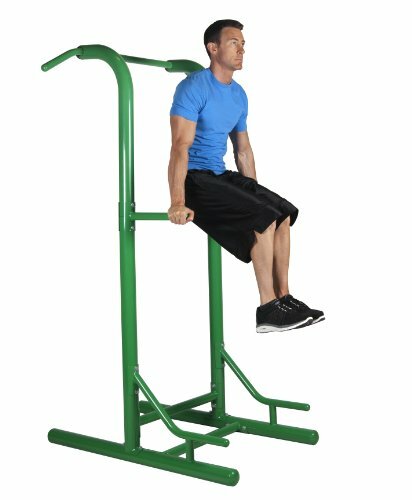 Power towers – a combination of a pull-up and dip station – is the ultimate exercise tool anyone can own. For an entire workout routine that can help you pack on muscle, develop serious strength, and eliminate fat, power towers need to be at the core of said routine. In this article, we’ll go over what a power tower really is, the benefits and exercises associated with one, what to look for when purchasing your own power tower with a dip station, and how to assemble your new equipment. We will also provide you with a power tower workout – a full-body pump with one piece – as well as our top Power Tower picks for your home gym. Without further ado, let’s get after it! 1 What is a Power Tower? A power tower is one of the most efficient pieces of equipment for any gym. Also referred to as “The Captain’s Chair” (which is extremely badass), power towers are known for building abdominal strength. They have padded armrests where your entire upper body stays rigid while you lift your knees up and down. However, the power tower can give you so much more. 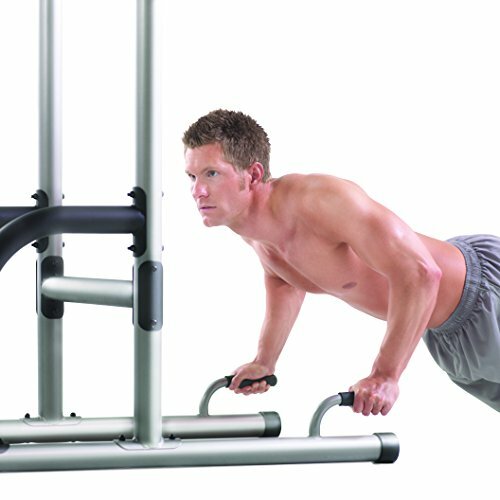 It is essentially a collection of bars connected to give you multiple surfaces for exercises. Most have horizontal and vertical bars at the bottom, a knee raise and dip station, pull-up bars above, and perhaps a few extra grips in various places. It’s functional: A power tower assists you in developing core strength and muscle, as well as giving you the ability to do the most beneficial exercises in calisthenics. By doing effective exercises – including compound movements – this creates a functional fitness that can only be achieved with gear such as the power tower. It saves space: It’s a single piece, which keeps your home gym fairly open. If this is the only thing you have – which it very well could be – then you can shove it against a wall and call it good. Out of the way and it can be your entire home gym. Win-win. Multiple exercises: We’ll go over this in the next section, but if we can develop a full body workout with simply a power tower, you know this thing is more than just for knee raises. Infinite progressions: The goal of any workout routine is to continuously improve, in the form of progressive overload of your muscles. With a power tower, your body weight, a weight belt, plates, and bands, you can adjust all of the exercises to your skill level. Continue to go from band-assisted to bodyweight to band resisted to weighted versions. Your gains will thank you. It’s compatible with other equipment: Gymnastics rings, resistance bands, weight belts, and more can be applied to the power tower. Do all of your favorite exercises in conjunction with this tower. With these simple yet super vital benefits, you can bet the power tower is the key to getting massive gains fast. Like we said previously, the exercise potential is limitless. With a power tower, you can effectively workout your chest, back, triceps, biceps, abdominals, forearms, and even your legs. As you can see, you can hit just about every muscle in your body that you’d want to work out. You can even do calf raises on the bottom bars if you felt so inclined. In a few sections, we’ll give you the full body power tower workout that will get your entire physique to the level you want. 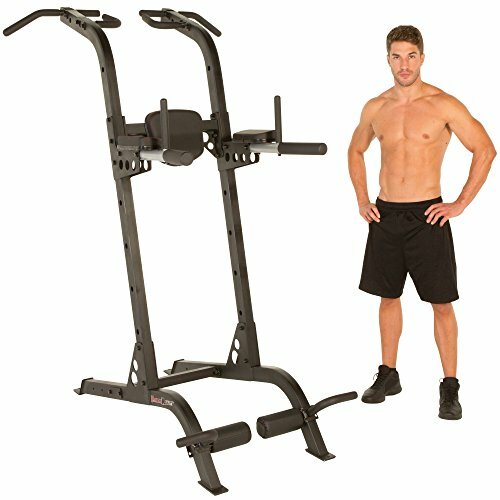 As with all workout equipment, you need to purchase a power tower after doing some research. There are some factors that go into the ideal piece for you and your goals. Take into consideration your weight and any weight you decide to add on once you progress to more than just your bodyweight. Your power tower will need to accommodate the poundage and then some. Best to look for something that can withstand somewhere around 300+ pounds. How much space will your power tower take up? If you’re short on square footage, you’ll have to opt for a skinnier, less-extensive power tower. However, if you have the area for a full-blown power tower, it will do wonders for your workout. Do you want different widths, grips, horizontal and vertical grips, attachments, etc.? The power tower’s functionality is what you make of it; add on as much as you want to get the most out of your equipment. This one is obviously a given. A power tower is quite a simply machine, so the price should emulate this fact. Nevertheless, you get what you pay for: Cheaply priced power towers will result in cheaply made power towers. Go for a nice blend of cost-friendly and quality. Depending on where you like to do your workouts – be it in the garage or the back patio – you’ll want to figure out if you need weatherproof materials. Perhaps you’ll have more room outside of the house; in this case, you’ll want a durable power tower that can withstand months of weather and outdoor elements. Protect your home gym. Power towers normally come with a few years’ worth of protection. Make sure you have the option and get insurance on your equipment. These are what you need to ask yourself before shopping around for your perfect power tower. Once you get your power tower, it’s all just a matter of assembling it to complete your home gym. According to professional installation services, the total time is takes to assemble a power tower is roughly two hours. The piece should come with its own array of nuts, washers, screws, and bolts. Some companies send you grease as well to help with the assembly process. For all of these tools, manual is what’s recommended; don’t use power tools for your power tower. Follow the step-by-step instruction manual you should get with your package to create your gym masterpiece. If you decide to anchor your power tower to the concrete in your garage or on your patio, that’s a whole different process. If you use concrete anchors, make sure you use materials that act like screws in the concrete. Most traditional concrete wedge-style anchors are a pain and you have to grind it off when you want to move your power tower. Specifically, using HD Concrete Anchors are really nice for securing your power tower to the ground. Drill out ⅜” pilot hole with a masonry bit, then drive the anchors through your power tower and into the pre-drilled holes. (Use a 9/16” socket.) When you want to move your power tower, simply unbolt, drill another set of masonry holes, and bolt it back down. As promised, here is the full body power tower workout. The sets and reps laid out in the plan are designed for the best hypertrophy (a.k.a. muscle growth). Rest time is to make sure you fatigue the muscle to the fullest by the last set and rep. This should hit all of your muscles. And all of these can be done with the help of a power tower. Give it a try and see how your muscles feel after! First up on our list of power towers is a top-of-the-line selection from the crew at Fitness Reality. We’re talking commercial grade here. Heavy duty powder coated steel tube frame provides an impressive display. This X Class power tower can withstand a whopping 400 pounds in weight capacity. It’s equipped with adjustable handlebars and back support, foam rollers, and multiple hand grips for pull-ups, providing you with wide range of exercises. While it’s a spendy piece, it could be your entire home gym, plus you can get either 3- or 4-year protection plans on this power tower. For the best of the best – your muscles will thank you – you can’t go wrong with the Fitness Reality X Class power tower. If getting a great deal is more your style, check out this awesome power tower that a fantastic value find from Golds Gym. Less than 30% of the price of the X Class, the XR 10.9 is a wonderful power tower that hits all of your needs. With a push-up station, multi-grip pull-up bars, and padded handles, this is a complete gym you’d be excited to workout on. The high quality materials Golds Gym uses makes for a long-lasting, amazing workout center. Versatile, dependable, and worth more than the price tag, the XR 10.9 might be your ideal power tower. The next power tower on our list is for the boxer training for fights. Merax comes swinging with their unique boxing take on a power tower. This monstrous workout machine has everything you expect in a power tower, with the addition of a speed bag attached to the backside. The frame is made from a sturdy steel, plus padding in the armrests and backrest. 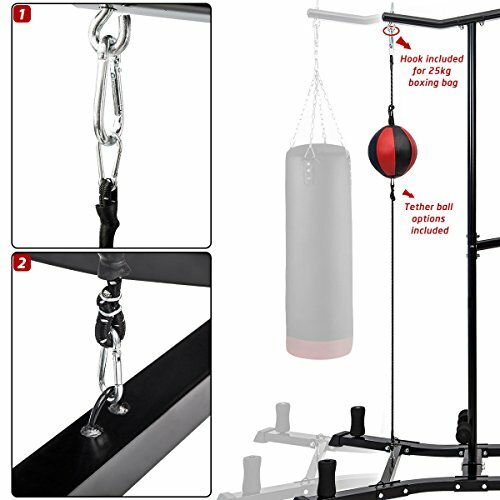 You tether the ball to the top and bottom, or you can switch it out for a full bag that you hang from the top. With this power tower, you get all of these extra features, yet you don’t have to sacrifice your wallet. If you want to get some cardio or training into your home workouts, the Merax Boxing Power Tower Combo is your new best friend. Lastly, we have a power tower built for the elements, straight from the bros over at Stamina. Reminiscent of playground equipment from when you were a kid, this bright green power tower has specially designed hardware to brave the harshness of being outside. The 65-1460 Outdoor has the basic bar setups, but you can still do a multitude of exercises. The only downside is you don’t have any adjustable pieces. However, it is weather resistant, paint chip and corrosion resistant, and has UV protection to keep its shiny green coat perfect for years. For the bare bones that can fit in your backyard, there’s nothing better than the Stamina 65-140 Outdoor. Your home gym deserves the very best. When it comes to versatile, durable, all-encompassing workout equipment, the power tower stands head and shoulders – literally – above everything else. Your one-stop shop for any functional fitness exercise you desire to rep out, the power tower has a ton of benefits and uses. Make sure when you go out to get yours that you do your research, as well as assemble it properly. Take a stab at our workout, find out which tower on our list is right for you, and start building the physique of your dreams with just a single piece of equipment. All hail the power tower!